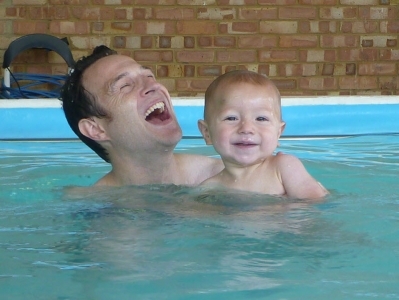 Your journey with Aquatots will be a memorable one we are sure and what better way to record those special moments than with some beautiful photos capturing your child in the water, both under the water in amazing swims, and above the surface too in some great family shots. At the start of that fantastic journey you will of course be really keen to have a keepsake so photos are offered in both Level 1 and 2 to capture those very early moments for your baby memory books etc. After this it’s once a year on average with photos being offered again in Levels, 5, 9, 13, 15, 19, 23 & L27. This schedule results in minimal disturbance to the class tuition, but allows you the great opportunity to have photos taken of your child at different ages and stages of development; as a baby, toddler and young child. The photos will be taken at your regular swim location, in your regular lesson* and time and will be taken by your familiar swim Teacher who has undergone extensive underwater photography training. Through our years of experience we have found that this gives us the best chance of your child being relaxed and comfortable during their photo shoot. Not only are they in familiar surroundings but the Teacher already knows your child and will have a better appreciation of what may get the best results whilst keep everyone relaxed. We like to keep things simple yet effective and therefore you won’t see us subjecting your child to lots of scary large camera equipment and lighting. No false backgrounds either. It’s all natural and all your child will see under the water, is their familiar teacher with a small yet very impressive HD digital underwater camera. Swimming photos more expensive than the swimming course itself???? Not with us!! Our aim is to provide you with 4 printed photos in 7x5" size and for this we charge £10. ** Not bad for a special memory captured forever. Of course we couldn’t let Xmas pass without some extra special photo opportunities so during your Autumn Term photo lesson we give all swimmers the opportunity (Mums & Dads included) to don a Santa Hat for our photos which we think you will agree look pretty cute. Please note: your photo day, is a combined photo and play day with minimal tuition carried out during week 7 of your 9 week term.